Garage doors, while possibly not top of the list when it comes to home improvement, provide both aesthetic and security benefits to your property. If you live in Bedford and are in the market for a new garage door, you need look no further than the Bullet Garage Doors team. We’ve been providing new doors and garage door repairs to the area for a number of years now, so we’ve built up a superb reputation in the area. 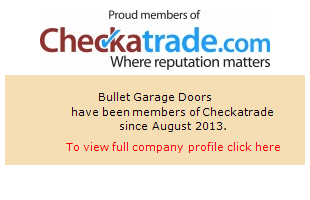 If you’d like to hear from our past customers, head over to our Checkatrade profile or view our testimonials. As we’re based in Dunstable, we’re just over half an hour away, meaning we can be with you at a moment’s notice. Being locally based is also important for home improvement services, in our important. It’s important to us that we’re able to relate to our customers, and that we’re close enough that we can come back out and see you if needs be. We’ve also got a great understanding of the kinds of properties commonly found in Bedford, which gives us the knowledge required to make informed recommendations. Our experience allows us to fit a wide range of garage doors, and we’re confident of finding the perfect model to suit your property. From the modern GRP models to traditional wooden styles, we’ve got you covered. We can also take your existing door and fit an automated mechanism to it, whether you’ve got an overhead canopy, retractable, or roller door to begin with. As well as installing new systems, we also provide garage door repairs to the Bedford area. Sometimes, you’ll find that your existing garage door is perfectly fine and it just requires a few simple fixes. In this situation, we’re happy to advise the best course of action for you. Our team has full access to a whole host of tools, so we’re extremely confident that we will be able to resolve the situation. If you require a new door for your garage, or you’re in need of garage door repairs, get in touch with Bullet Garage Doors. You can give us a call on 01234 604 025, or fill out one of our online contact forms. Fitted behind timber arch a new electric insulated roller door in white with white guides and front fascia box. Also fitted new personnel door to the rear with matching steel frame.